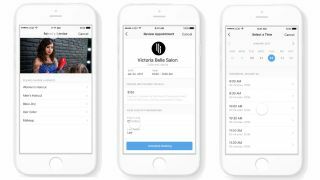 Instagram has begun rolling out an in-app purchase feature to some of its users, starting with the ability to book appointments via companies' accounts. If you're one of the people with early access, you can register a payment card, set a PIN, and start splashing your cash without ever leaving the comfort of those little square photos. Instagram has confirmed that the feature is now live for a limit number of businesses including restaurants and salons, so if a quinoa salad or rainbow braid catches your eye, you'll be able to book yourself in for a similar treat with a couple of taps. Instagram introduced a shopping feature last month, letting users select tags on photos to see price tags and a link to the retailer's storefront, but the new tool keeps you within the Instagram app rather than ferrying you to a third-party site. "People come to Instagram every day to discover and buy products from their favorite businesses," said Instagram's global head of business Jim Squires after the launch of shoppable tags. "We want to be that seamless experience. Whether it’s a local artisan, florist or clothing store, shopping directly on Instagram has never been easier."